Today we are introducing Amazon ElastiCache so that you can easily add caching logic to your application. 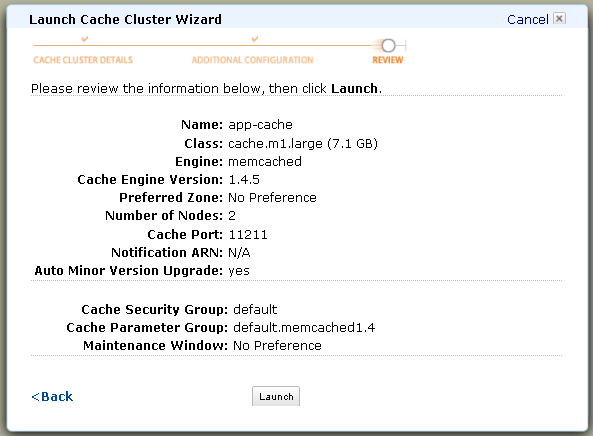 You can now create Cache Clusters, each comprised of one or more Cache Nodes, in a matter of minutes. Each Cache Cluster is a distributed, in-memory cache that can be accessed using the popular Memcached protocol. You can often make your application run faster by caching critical pieces of data in memory. Information that is often cached includes the results of time-consuming database queries or the results of complex calculations. In this example, the Cache keys are the string “Calculate” and the values of A and B. In practice these three values are generally combined into a single string key. The Cache will store previously computed values. Implicit in this example is the assumption that it takes more time to perform the calculation than it does to check the cache. Also implicit is the fact that the cache can expire or evict values if they become too old or if the cache becomes full. 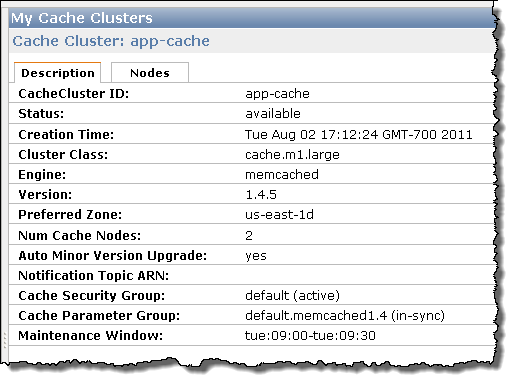 If you are already running Memcached on some Amazon EC2 instances, you can simply create a new cluster and point your existing code at the nodes in the cluster. If you are not using any caching, you’ll need to spend some time examining your application architecture in order to figure out how to get started. Memcached client libraries exist for just about every popular programming language. A Cache Security Group regulates access to the Cache Nodes in a Cache Cluster. A Cache Cluster is a collection of Cache Nodes. Each cluster resides in a particular AWS Availability Zone. A Cache Node is a processing and storage unit within a Cache Cluster. The size of a cluster can be increased or decreased as needed. 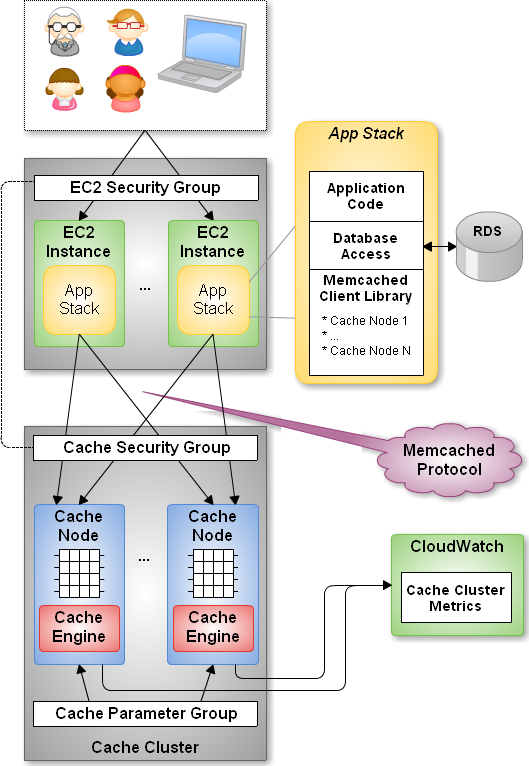 Each node runs a particular version of a Cache Engine. 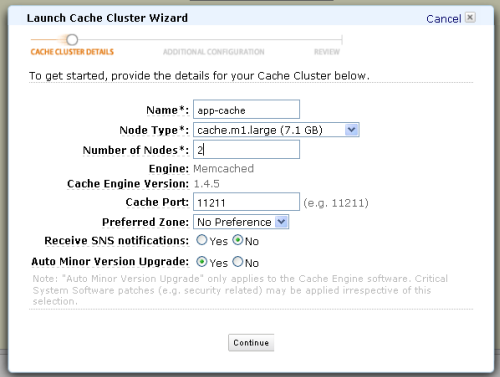 Amazon ElastiCache supports nodes with cache sizes ranging from 6 to 67 GB. A DNS name is assigned to each Cache Node when it is created. A Cache Engine implements a caching protocol, algorithm, and strategy. The initial release of Amazon ElastiCache supports version 1.4.5 of Memcached. 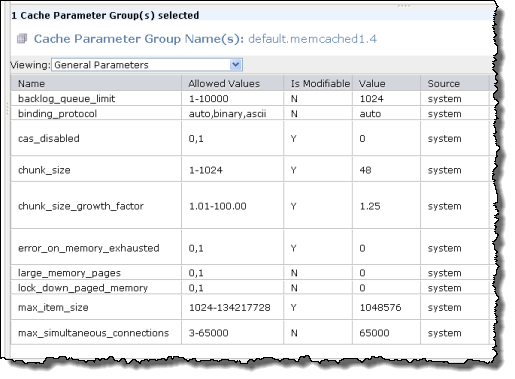 A Cache Parameter Group holds a set of configuration values that are specific to a particular type and version of a Cache Engine. The AWS Management Console includes complete support for Amazon ElastiCache. Let’s walk through the process of creating a cluster. 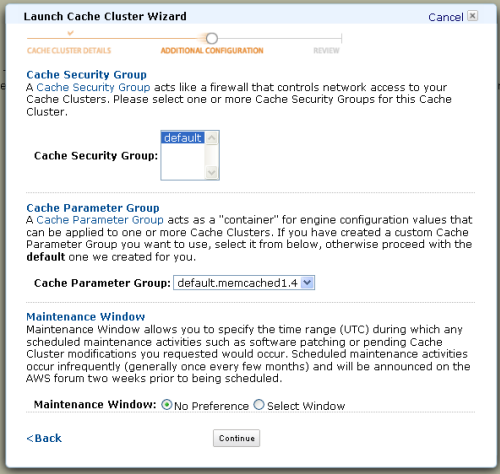 Next, you can select one or more Cache Security Groups, and a Cache Parameter Group. You can also specify a maintenance window during which Amazon ElastiCache will install patches and perform other pending modifications to the cluster. 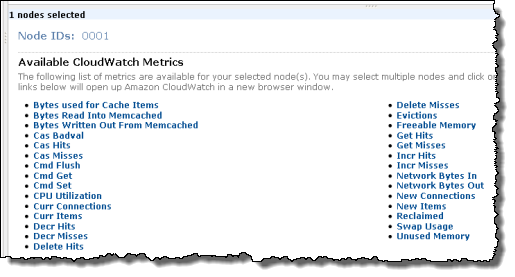 Each Cache Node reports a number of metrics to Amazon CloudWatch. You can watch these metrics to measure the efficacy of your caching strategy. The metrics should also give you the information that you need to make sure that you have enough memory devoted to caching. You can also inspect each of your Cache Parameter Groups. The groups can be modified using the Amazon ElastiCache APIs or from the command line. Once you have launched your cluster, you can configure the DNS names of the nodes into the client library of your choice. At present this is a manual copy and paste process. However, over time, I expect some of the client libraries to add Amazon ElastiCache support and thereby obviate this configuration step. Your application can elect to receive an Amazon SNS (Simple Notification Service) notification when a cluster is created, or when nodes are added to or removed from an existing cluster. You should definitely watch the CloudWatch metrics for your Nodes, and you should adjust the type and number of nodes as necessary. Most of the client libraries treat the cluster as a unit. In other words, you direct your Put and Get requests to the cluster and the library will algorithmically choose a particular node. The libraries do this using a hash function to spread the data out across the nodes. If you plan to dynamically resize your cluster, you need to make sure that you client library uses a consistent hash function. A function of this type produces results that will remain valid even as the size of the cluster changes. Ketama is a popular consistent hashing algorithm for Memcached; you can read all about it here.